We all know this to be a fact, whether from personal experience of that of those close to you. Maybe none of us were prepared for how much our children changed our lives, but that ship has now sailed. We have kids and we’re loving it, right? Right! So, just like having your first child, or in our case… the last two, the new addition(s) can definitely rock your world. Road trips are no different! Taking your kids on their first travel adventure will most likely, rock it again. Whether your new travel life will include diaper changing and nap times, depending on the age of your children, it will more than likely include more planning and prep to make the kids are both enjoying themselves and comfortable along the way. Everyone will tell you, ‘the best thing you can do is to be prepared’. So when planning your trip, however long or short it might be, keep in mind the different types of days you’ll have to plan and prepare for, to keep the journey running smoothly for everyone. Road trips can be awesome family bonding experiences and its easy to get carried away, planning a whirlwind trip- like the years before children. But try to keep in mind that while fun and enjoyable, road trips can also be pretty hard on the kids, especially if they’re expected to sit quietly for hours on end just bouncing around the map. During our 3 years of extended family travel, we’ve found that there are four types of days that will ultimately guide your trip: travel, tour, rest and prep. Each day is important for its own set of reasons, and you’ll need to do some trial and error before figuring out how many of each and which order and combination will work best for you and your crew, but after you know the days and find your sweet spot- family travel will become easy and much more enjoyable, due to the decrease in anxiety and stress. Grab your GPS and plug in your coordinates, it’s time to hit the road. The kids are packed up, the husband is ready and you have all the fun road trip items you need in your emergency entertainment kit, so off you go. These are your travel days. They’re spent driving from point A to point B with a few gas stops, potty breaks and snack runs in between. Full of fun and exploration travel days will keep the road trip moving. Keeping kids occupied is hands down one of the most important jobs of the copilot. So use games like ‘I Spy and License Plate Bingo to keep them entertained as the time passes by. We’ve personally found that travel days can also be great for roadschooling. The kids can be occupied with workbooks and flashcards during the ‘regular’ school hours and you can keep backseat bickering to an all-time low, with pop quizzes and spelling bees. This works especially well in keeping the kids on track with their lessons on longer trips. With maps, travel guides, attraction tickets, and a picnic lunch, your family hits the streets to discover this new and exciting destination you’ve landed in. You walk through museums and admire landmarks, you talk to locals and ask for many directions, then enjoy your hair blowing in the wind from the rooftop seat on the double-decker tour bus. These are tour days and they are packed with fun, excitement a bit of organized chaos. Tour days can become whirlwinds of new experiences for your family. Everything is at your disposal, all you have to do is do it. Choosing to do a few things each day, one thing or everything you can cram in is the biggest decision. With so much to see and do, you’ll want to keep the kids in mind before exhaustion and frustration tantrums ruin your trip. Make an effort to keep their schedule as close to normal as you can. Keeping meals, naps, and bedtimes the same will help tremendously with smaller children. Our family has fallen into a routine of getting out after breakfast and being back before dinner. We enjoy ½ a day sightseeing, hiking, touring or whatever, then return for dinner and some R&R in the evening before we do it all again the next day. Your computer is fully charged, you’ve got excel pulled up with your travel budget, and your route maps are right by your side for easy access. 2 loads of laundry are currently drying, while the kids are sorting through the enormous amount of toys with missing pieces to add to the trash pile. This is a prep day and every road trip needs at least a couple. 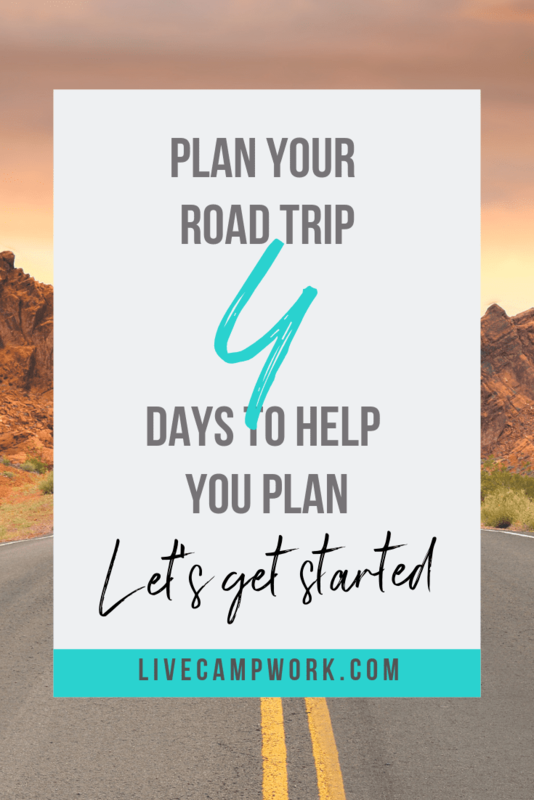 While most planning and prep is done prior to the start of the trip, that doesn’t mean there won’t be any after you get started. Tasks like evaluating your route, adding or deleting stops, and preparing for major events and activities will need your attention while on the road. Coupled with just traditional family tasks like laundry, purchasing snacks and bottled water, and decluttering the amount of luggage you’re toting around- prep days can be just as much work as the travel itself. I know some folks might be tempted to mix a prep day with a rest day and knock them out in one shot, but I have to urge you to reconsider. Prep involves mental and physical work, which is the complete opposite of rest. So while you might be tempted to combine them, my suggestion is to schedule them separately and give yourself the amount of time you need, to complete your errands and tasks without skimping yourself out of much needed time off. Hit the snooze button and snuggle deeper into your pillow. Pull the covers up around your neck and prepare yourself for a deep snooze of at least 30 minutes. The kids are on their own this morning and breakfast will likely be something they can easily fix for themselves or at least something that doesn’t require much effort on your part. This is a rest day, and you should enjoy these wholeheartedly because you desire it! It’s a day of rest and everyone desires at least one, so try to plan one after a tour day or two and also in-between a chain of extended travel days. Taking time to rest when your either tired from walking or tired from riding, both will require a change of pace for you and the kids, so give yourself and the family a break and just relax today. Instead of packing today, just hang out. Recap the events of your trips, make a scrapbook of your photos or have the kids write a few postcards to your family. Take some time off- that doesn’t require much thought or physical activity. Kick your feet up and watch a movie or two and enjoy some freshly made popcorn. So there you have it- four days that can easily plan your travels. Using them in whatever combination you decide best, is often the result of trial and error. Once you take your first trip or maybe two, you’ll have a good feel for the amount of time your family needs in-between travel days and how many tour days are comfortable. You’ll know pretty quickly how long is too long and how short is too short. Try alternating between days, and adding variety to keep the trip fun for the little ones. Whether broken up into groups, separated by rest, tour, or prep days, or run like a marathon, however you decide to schedule your travel- the choice is yours!